Even if you didn’t enjoy a lick of last year’s jungle-themed, fist-bumping Far Cry 3, it would be an absolute mistake to discount its upcoming downloadable content. Blood Dragon is flipping the script on the once serious first-person shooter from Ubisoft, and while there have been a handful of leaks earlier in the week relating to the game, this latest trailer is as official as they come. Blood Dragon won’t require the original game disc, knowledge of why Jason Brody was on that island, or any love of the Far Cry franchise. Really, all you’ll need is a sense of humor as you take control of Sargent Rex Colt. As a rough, tough Mark IV Cyber Commando doing battle against a rogue cyborg army, Colt only has three objectives: kill bad guys, get his girl and save the world. “Experience every cliché of a VHS era vision of a nuclear future, where cyborgs, blood dragons, mutants, and Michael Biehn (Terminator, Aliens, Navy Seals) collide,” the description reads. The above trailer actually comes directly from Ubisoft’s Youtube page this time around. Previously, an extended portion of gameplay was discovered on a channel seemingly unrelated to the publisher/developer, but has since been yanked. 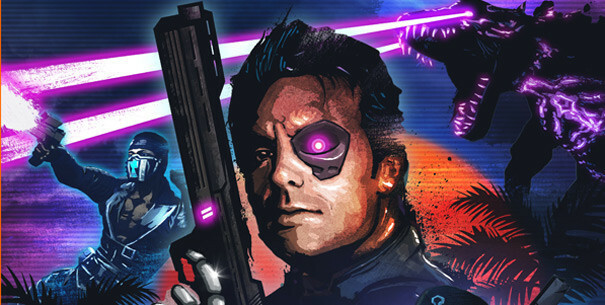 Far Cry 3 Blood Dragon may not be a full, retail game, but it’s drawn some of the most attention this year. Look to discover just why people are talking so much about it when it hits PSN, XBLA and PC May 1. Just be prepared to turn your brain off and accept the colorful world around you. Are you excited for this odd piece of content? Will you be downloading it next month? Let us know what you think by leaving a comment below!